So you've just spent hours cramped up in a dirt-laden, odor-soaked van along with your bandmates who happen to share those very same qualities. You've twisted and turned your way through the (often less than) glamorous back roads of the US and endured everything from traffic jams to bad weather, Baltimore, and that fast food meal that didn't sit so well. Ragged and weary, you finally arrive to the venue for tonight's gig. A faint smile gently appears on your face as you now get to escape the confines of that hellish four-wheeled environment and finally relax. Unfortunately, that's the last thing you should be doing. Getting to the venue means preparing for soundcheck, a ritual that all too many bands pass off as time to goof around before the show. If you're serious about a career in music, you should know that a proper soundcheck is the essence of a good live performance. Take it just as seriously as you would the gig later that night. To make your life easier as well as the venue's staff, there are a few unspoken rules to follow during the course of the soundcheck. Follow them, and your performance will only benefit. Sounds like common sense, right? Well, a lot of these unspoken rules are, yet few people manage to follow them. Whether the venue has staff helping you or not, it's in everyone's best interests to get your gear inside. Stop eyeing that burrito joint across the street, and don't worry about missing happy hour at the bar. Work now, play later. Soundcheck is stressful enough without the added effect of the time crunch. More time to set up means a more relaxed atmosphere for everyone. Contrary to popular belief, relaxation is actually a good thing. Aside from good work ethic, getting your gear inside quickly is just safer. Unless you have one of these, keeping your gear in the van exposes it to theft, among other things. It doesn't matter if they're graduates from a prestigious audio school or just some pimple-faced teens from around the corner. Your sound is in their hands. They may not be onstage, but they sure can have a role in how you guys sound when you're up there. That being said, it's best to treat these people with respect. Without them, live music wouldn't exist and that annoying feedback sound we all just love so much would cease to disappear. Unless you're a huge rock star… actually, that doesn't matter either. No matter what level in your career you're at, it never hurts to treat the crew with respect. In fact, let's just add treating everyone with respect to the list. How bad can it really be? Big-name acts have the luxury of just jamming for hours until their desired sound is accurately dialed in. However, when you've got 15 minutes and a few other impatient bands after you waiting to get their turn, efficiency is the key. 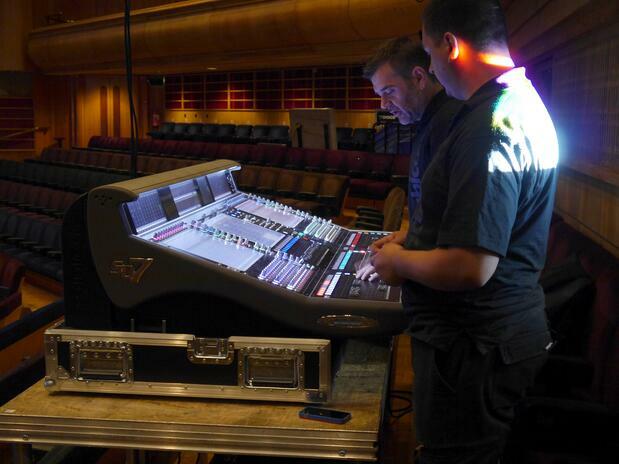 Playing the same song or two every gig for soundcheck will help speed up the process. You'll be familiar with how that song should sound onstage, which will allow you to hone in on your levels with lightning speed. Try to pick some well-rounded songs that exhibit both a balance of vocals and instrumentation so the sound engineer can get a feel for the music better. Just as a side note, don't be that guy who soundchecks at level three volume and turns it to 11 come show time. This isn't Spinal Tap, and plus, nobody likes that guy. 4. For goodness' sake, keep your cables organized! This isn't your parents' garage where that tangled mess of cables will fly. I don't care if your unique methodology of organization "just works, man" – be a professional about it, and wrap your cables properly. Showing up to a venue with a box of cables that has to be untangled before anything can be done is no way to go about business. You'll save time, frustration, and the longevity of your cables' lives if you learn how to wrap and store them properly after every gig. For those who don't know how, grab some popcorn, your favorite teddy bear, curl up on the sofa, and watch this lovely instructional video. Backlining is a beautiful moment when two bands can put aside their personal differences and share their gear, all for the sake of a smooth-sailing show. When it works well, it's a masterpiece of artistic cooperation displayed by the seamless transition between set changes. This graceful craft is completely worthless if you wait until the last minute to discuss it, though. Soundcheck is the time to do it. Whether you're letting someone use your gear or potentially using theirs, have a quick talk before the show so everyone will know what to do. Five minutes before your set is not the time to be scrambling around for your drum set because you thought you'd be covered. Yes, soundcheck is a time to work and not relax, but there's a way you can go about the process with a cool, calm demeanor. No need to run around like a chicken with its head cut off. Just keep your head down, do what needs to be done, and play it cool. Finding that perfect balance of urgency and relaxation will not only help the soundcheck go smoothly, but will put you in the right state of mind for that upcoming performance. As stated before, most of these tips aren't mind-blowing secrets, but if practiced diligently and regularly, it can help make a fun and challenging career that much easier.